Today is the second in our series of bronze-themed posts, highlighting some 2019 releases in this case material. Some of the models may already be known to you, but hopefully some are new. In 2018 Bell & Ross expanded their BR03-92 Diver Collection with a blue-dialed stainless steel model, and a new piece in bronze. That customers have happily accepted the idea of a square-cased dive watch (where handling the bezel underwater might be a bit more challenging) is perhaps in part related to the fact that most diving watches don’t go anywhere near a diving suit. The blue model was a colour change but the Diver Bronze was a material one, a 42mm x 42mm sized case of CuSn8 bronze (alloy with 8 per cent tin). With a unidirectional bezel of bronze and an engraved black-filled 60-minute scale, it had/has a matte black dial featuring gold-plated indices and hands, and came in a limited edition of 999 pieces, with a special engraved case back, and on an aged-look leather strap. 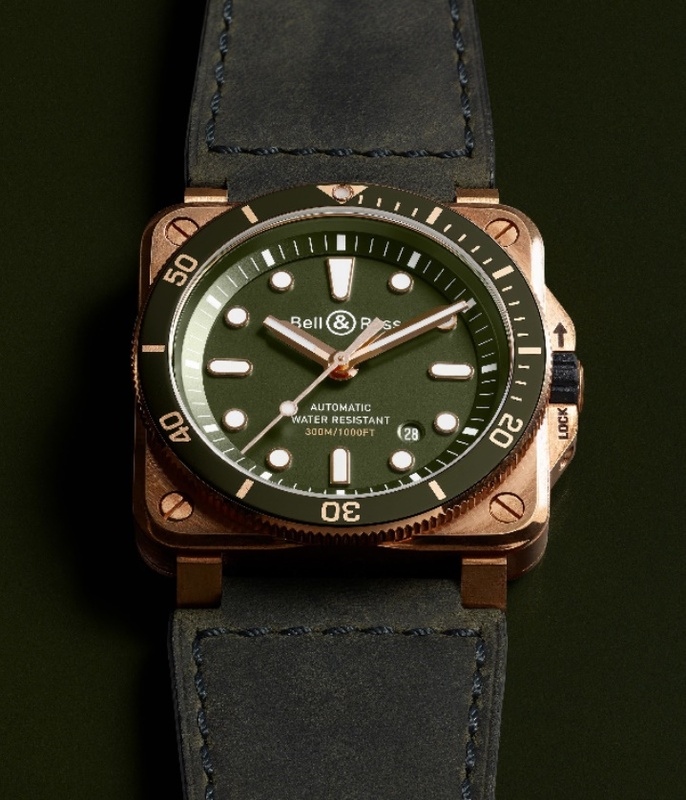 At Baselworld 2019, Bell & Ross followed up on this 2018 release with a new bronze-cased BR 03-92; the Diver Green Bronze with, as the name states, a (rather dark) olive green dial. It is also a limited edition piece, with the same (999) limitation number. Coming in the same 42mm x 42mm CuSn8 case (8 per cent tin and 92% copper) with a water resistance of 300m, it has a unidirectional bronze with an anodised aluminium insert. The case back is stainless steel, and has the same engraved decoration as last year’s older bronze sibling. The dial has gold-plated appliqué indices with Super-LumiNova inserts and gold-plated skeletonised Super-LumiNova-filled hands. Inside is the same automatic Calibre BR-CAL.302 (base Sellita SW-300) that was used in the 2018 Diver Bronze. It has a power reserve of thirty-eight hours. Although it comes on a khaki leather strap with a bronze pin buckle, as you can see in these photos, there is an extra rubber strap that comes with it, for diving. If you want to get the full ‘patination effect’ of having a bronze watch, a bit of sea water would not go astray. The RRP for the new BR 03-92 Diver Green Bronze should be around the 3,800 EUR mark.